A set of late 12th and early 13th Century stained glass windows are to go on display in Canterbury Cathedral after they were removed for restoration work. The windows depicting life-size figures representing the ancestors of Christ were high up in the building and could only be viewed from a distance. An exhibition will allow the public to study the windows close up. The medieval glass will be replaced in the Great South Window later this year. The windows were removed from the cathedral to allow work to be carried out on its crumbling stonework. They have returned from exhibitions in the J Paul Getty Museum in Los Angeles and at the Metropolitan Museum in New York. 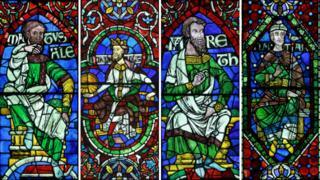 Visitors to Canterbury Cathedral will be able to see 21 of the 43 surviving windows at close quarters between 18 May and 23 August.